Although you may have noticed that much of our business is around diesel injector services, testing and cleaning your gasoline injectors is a service we’ve been performing for more than 20 years. Like all things at our shop, we keep our gas injector knowledge and equipment up-to-date as the industry evolves. We recently upgraded to the sophisticated ASNU Classic GDI cleaning machine, guaranteed to restore your injectors to their original condition—as good “asnu”. 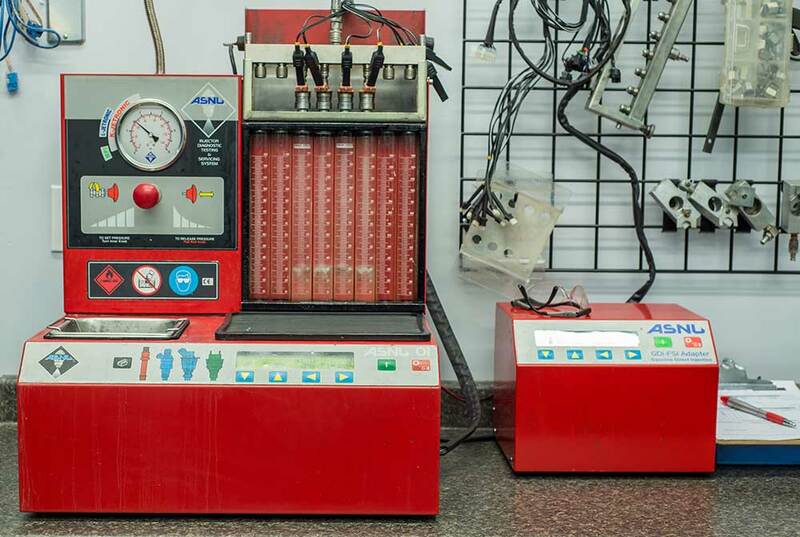 The ASNU Classic uses ultrasonic cleaning technology to accurately test all types of gasoline fuel injectors from top feed to side feed and gasoline direction injection. Before putting your injectors in the ultrasonic cleaning bath, we conduct a pre-test, measuring flow rates, spray pattern, and general operation, to determine the baseline. The ASNU technology uses soundwave technology to conduct a thorough, impossible-to-reach cleaning. Given that gasoline injectors don’t come apart, this is a handy machine to have. We pulse your injectors during this process to ensure all internal components get cleaned and flushed, then conduct the same range of tests as before to monitor improvements. Your injectors will be returned to you complete with a written report, before and after cleaning results, and all the necessary gaskets and seals to reinstall. Regrettably—although rare—there are times when your gasoline fuel injector cannot be fixed by cleaning (a shorted coil or physical damage, for instance). When this occurs, it, unfortunately, means you need a new gas injector. The good news is that we always operate on a strict “no fix, no pay” policy and will not charge you when we are unable to provide a solution to your gas injector problem. There are many ways to ensure your gasoline fuel injectors remain in working order for longer. These include using good quality gasoline, good vehicle maintenance, and heeding to the manufacturer’s advice and recommendations (with rapidly changing technology, DIY and backyard mechanics are soon becoming a thing of the past). For more details, take a look at our blog post on gas injector cleaning and maintenance.